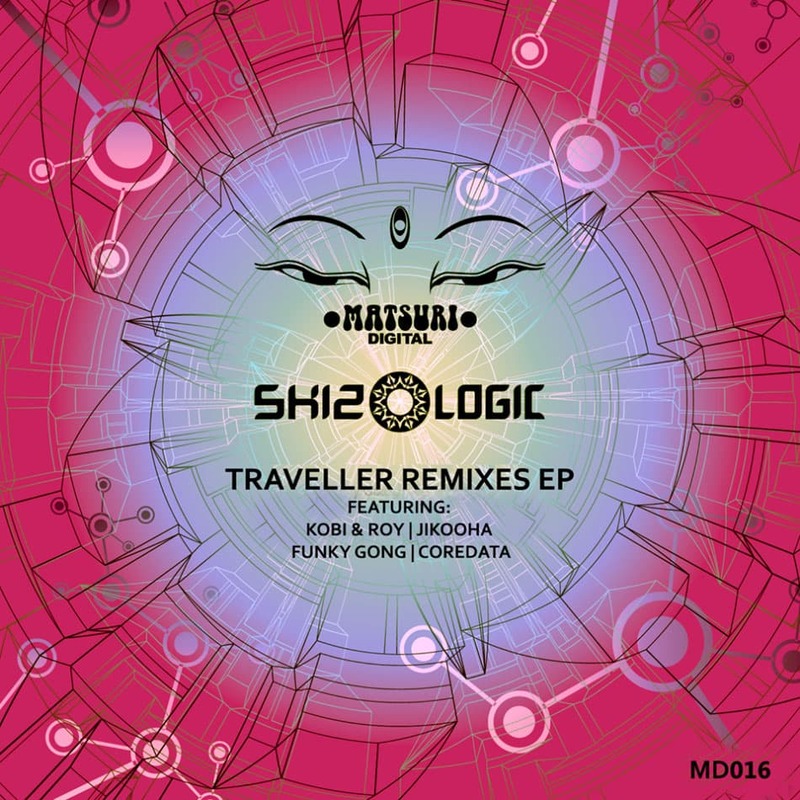 In 2015 Matsuri Digital released the Traveller EP by Israeli Nu-Goa artist Skizologic, who has in recent years played at the major European festivals and who ended 2017 with a hugely successful Japanese tour. Now the global psychedelic traveller is back with Matsuri with a new release: the Traveller Remixes EP, featuring four brilliant versions by international producers of that first release, each reflecting different dimensions of the track. Funky Gong from Joujouka, whose reboot of Prana’s classic Boundless was ripping apart dance floors across the planet, offers a remix that fuses the original’s ethnic roots and bouncy baseline with funky breaks as well as a powerful four-on-thefloor kick that builds tension throughout the track. Next is Coredata, a promising talent from the UK blasting with 90s acid vibes, whose take features a more driving rhythmic pulse, full-frequency percussive loops, and a frenetic 303 buildup that’s sure to raise the roof each time it’s dropped on the dance floor. Kobi Toledano of Loud joins forces with Roy Sason, founder of the Zion 604 label, for a mystical reworking that emphasizes the track’s harmonic elements with atmospheric effects, a groovy bassline, and massive acid riffs – perfect for twilight and sunrise. Finally, Japanese Nu-Goa producer Jikooha bring their analogue synth vibe to their revisioning of the track, blending acidic,melodic, and rhythmic elements in higher frequencies to create an uplifting, celebratory atmosphere. With Skizologic’s 2017 year-end performances fresh in the memory of Japanese audiences. Matsuri is thrilled to give international audiences a taste of what will be rocking dance floors worldwide in 2018!